Go to original pattern for design DROPS 184-32. 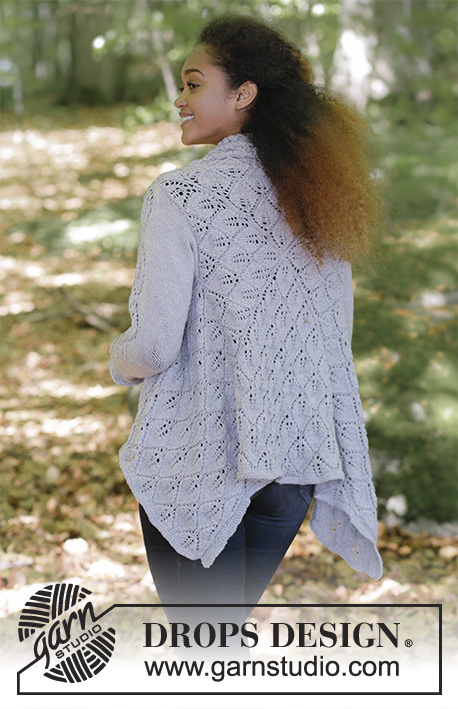 Knitted square jacket with lace pattern. Sizes S - XXXL. The piece is worked in DROPS Cotton Merino. "Alternative yarn (Yarn group B)" – see link below. DROPS DOUBLE POINTED NEEDLES AND CIRCULAR NEEDLE (80 cm / 32'') SIZE 4.5 mm/US 7 – or the size needed to get 20 stitches and 26 rows stockinette stitch on 10 cm / 4'' in width and 10 cm / 4'' in height. DROPS DOUBLE POINTED NEEDLES AND CIRCULAR NEEDLE (80 cm / 32'') SIZE 4 mm/US 6 for garter stitch – or the size needed to get 21 stitches and 28 rows stockinette stitch on 10 cm / 4'' in width and 10 cm / 4'' in height. 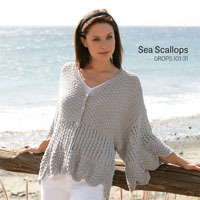 You can get the yarn to make this pattern from	64.50$. Read more. See diagrams A.1 to A.8. 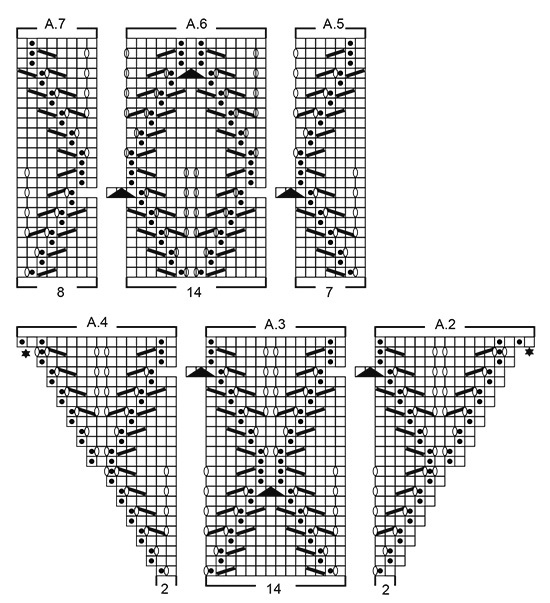 The diagrams show all the rows in the pattern seen from the right side. 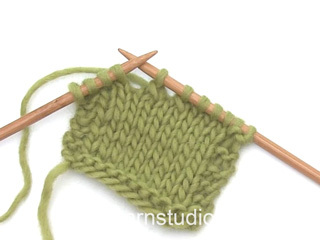 Decrease 1 stitch on each side of the marker thread as follows: Work until there are 2 stitches left before the marker thread, knit 2 together, (marker thread), slip 1 stitch as if to knit, knit 1, pass the slipped stitch over the knitted stitch. 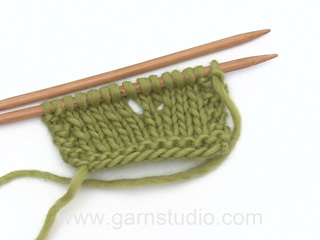 To avoid the bind-off edge being tight you can bind off using a ½ needle size larger. The piece is worked in the round into a square with double pointed needles/circular needle starting from mid back. Bind off for the armholes, then continue the square to finished length. Then work back and forth, out to each side towards mid front of the jacket, but without increasing. The sleeves are worked in the round with double pointed needles, top down. 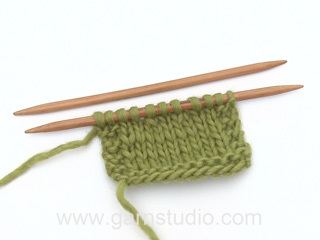 Cast on 8-8-8-8 stitches with double pointed needles size 4.5 mm / US 7 and Cotton Merino. Work pattern in the round according to diagram A.1 a total of 4 times on the round - read PATTERN above. Change to circular needle when necessary. REMEMBER THE GAUGE! When the whole of diagram A.1 has been completed there are 128 stitches on the round. Insert 4 markers without working the stitches as follows: insert the first marker at the beginning of the round, the second marker after the next 32 stitches, the third after 32 stitches and the fourth after 32 stitches; allow the markers to follow your work onwards. Now work pattern as follows: Work * A.2 (= 2 stitches), A.3 over the next 28 stitches (= 2 repeats of 14 stitches) and A.4 (= 2 stitches) *, work from *-* a total of 4 times on the round. When A.2/A.3/A.4 have been completed in height there are 60 stitches between each marker (= 240 stitches on the round). Now work pattern as follows: Work * A.2 (= 2 stitches), A.3 over the next 56 stitches (= 4 repeats of 14 stitches) and A.4 (= 2 stitches) *, work from *-* a total of 4 times on the round. When A.2/A.3/A.4 have been completed in height there are 88 stitches between each marker (= 352 stitches on the round). Continue pattern in this way - each time the diagrams are repeated in height, work 2 more repeats of A.3 between A.2 and A.4 (= 8 increased repeats on the round). When the square measures approx. 36-38-40-42 x 36-38-40-42 cm / 14 1/4"-15"-15 3/4"-16½" x 14 1/4"-15"-15 3/4"-16½" (adjust so that the next round is without yarn overs) bind off for the armholes as follows: bind off the first 38-42-44-46 stitches for armhole, work until there are 38-42-44-46 stitches left before the fourth marker, bind off the next 38-42-44-46 stitches for armhole, work as far as the first marker. On the next round cast on 38-42-44-46 stitches over the armholes; the stitches are then worked into the pattern. Continue the pattern until A.3 has been completed a total of 3-4-4-4 times in height (there is now 1-½-1-1 repeat left in height before finished measurement of square). Now work the first 22-10-22-22 rounds as before. 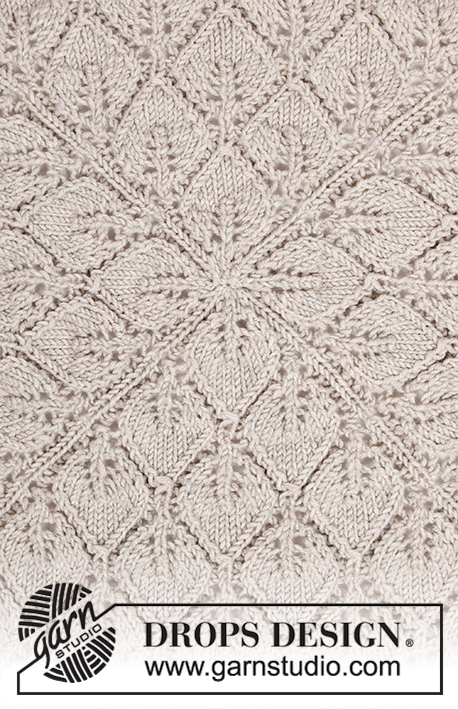 Work the next round in the diagrams, but skip the first 2 yarn overs in A.2 and skip the last yarn over in A.4. 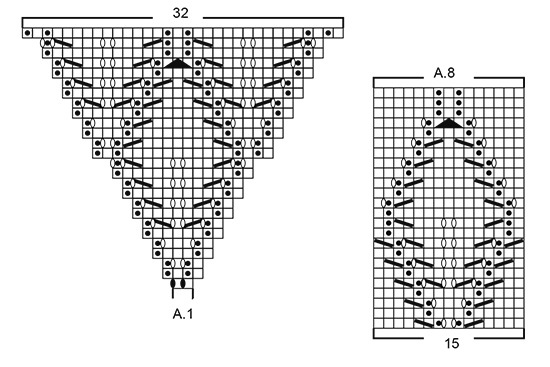 The next round in the pattern is worked as follows: NOTE: Skip the first 2 squares in A.2 and skip the last square in A.4 - Work from the first to the second marker and place these 141-155-169-169 stitches on 1 thread (= left front piece), work to the third marker and place these 141-155-169-169 stitches on 1 thread (= bottom edge), work to the fourth marker and place these 141-155-169-169 stitches on1 thread (= right front piece), work to the first marker = 141-155-169-169 stitches left on needle (= neckline). Change to circular needle size 4 mm / US 6 and work 2 RIDGES back and forth - see description above, over these stitches. Loosely bind off - read BINDING OFF TIP above. Place the 141-155-169-169 stitches from the bottom edge on circular needle size 4 mm / US 6 and work 2 ridges back and forth over these stitches, loosely bind off. The piece is worked back and forth. 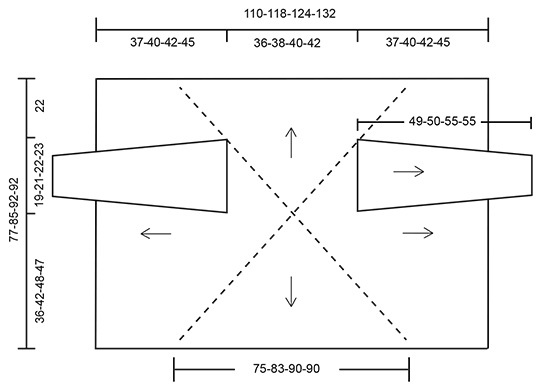 Place the 141-155-169-169 stitches on circular needle size 4.5 mm / US 7. Start from the right side and work as follows: Knit up 3 stitches in the side of the ridges from the neckline, work A.5 (= 7 stitches) - read PATTERN above, work A.6 (= 14 stitches) a total of 9-9-11-11 times in width, work A.7 (= 8 stitches) and knit up 3 stitches in the side of the ridges from the bottom edge = 147-161-175-175 stitches. 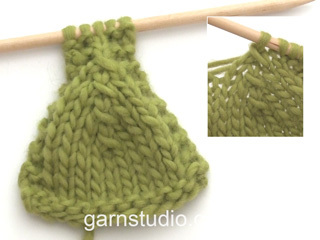 The 3 stitches in each side are continued in garter stitch. Continue this pattern until A.5/A.6/A.7 have been completed 2-2-2-2 times in height, then work the first 0-0-0-12 rows in the pattern. Change to circular needle size 4 mm / US 6 and work 2 ridges, loosely bind off. Place the 141-155-169-169 stitches on circular needle size 4.5 mm / US 7. 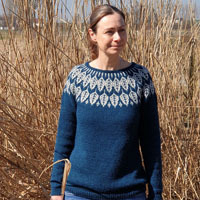 Work as for left front piece, but the first row starts with knitting up stitches in the side of the ridges from the bottom edge and finishes with knitting up stitches in the side of the ridges from the neckline. The piece is worked in the round with double pointed needles, top down. 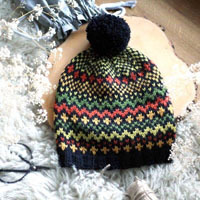 Cast on 75-85-89-93 stitches with double pointed needles size 4.5 mm / US 7 and Cotton Merino. Insert 1 marker at the start of the round, allow the marker to follow your work onwards = mid under sleeve. Work the next round as follows: Knit 30-35-37-39 stitches, diagram A.8 (= 15 stitches), knit 30-35-37-39 stitches. Continue this pattern. When the piece measures 2 cm / 3/4'' decrease 1 stitch on each side of the marker - read DECREASE TIP above. Decrease in this way every 3-2½-2½-2½ cm / 1 1/8"-7/8"-7/8"-7/8'' a total of 14-17-18-19 times = 47-51-53-55 stitches. When the piece measures 48-49-54-54 cm / 19"-19 1/4"-21 1/4"-21 1/4'' - adjust to after the 12th or 24th round in the pattern, change to double pointed needles size 4 mm / US 6 and work 2 RIDGES - see description above. Loosely bind off. Work one more sleeve in the same way. up and down, then tighten and fasten the thread. Hej! Jag igen, jag har läst igenom beskrivningen och blir inte klok. Fastnat i meningen ”När rutan mäter ca 36 cm *36 cm osv maskas det av för ärmhål” Det jag inte förstår är hur jag ska mäta rutan, hur, var mäter jag rutan? Antal maskor på varvet är 352 st, 20 m är 10cm, så varvet borde vara ca 176cm, hittar inga rutor att mäta, bara trianglar möjligtvis? Hoppas på hjälp, klarhet. Hej, du ska börja med att lägga upp 8 maskor i din storlek, sedan ökas det enligt diagram A.1 som upprepas totalt 4 gånger på varvet. Liebe Frau Stolpe, können Sie uns bitte sagen, welchen Browser/Betriebsystem Sie benutzen? Liebe Andrea, wir haben gerade diese Anleitung gedruckt und es hat funktionniert, beachten Sie die Einstellungen Ihrer Drucker, damit alle Seiten ausgedruckt werden. Viel Spaß beim stricken! Hallo. Wenn ich mit der Jacke beginne und in Runden stricke, habe ich ja in der Mitte ein Loch, das ist aber nirgends zu sehen. Verschließe ich das am Ende? Liebe Doreen, ja genau, am Ende verschließen Sie dieses Loch. Viel Spaß beim stricken!